1. Preheat the oven to 200ºC, gas mark 6. Cook the bacon in a frying pan for 5 minutes until starting to crisp. 2. Layer up a third of the potatoes and spinach in a medium-sized ovenproof dish. Scatter some cheese, cooked bacon and salad onions on top. Continue to layer up the ingredients, setting aside a handful of cheese for the top. 3. Whisk together the crème fraîche, stock and mustard and pour over the layered gratin, then scatter over the reserved cheese and a good grinding of black pepper. Bake for 50 minutes until cooked through and golden brown, covering with foil towards the end if the top starts to get brown. About 10 minutes before the end of baking, scatter over the breadcrumbs and pumpkin seeds. Serve warm. This is great to have as a side dish, too. 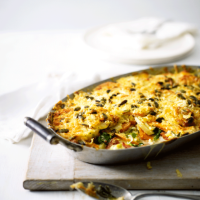 Serve a smaller portion of the gratin to enjoy with roast meats such as lamb or chicken.